Tan Enhancement Products are developed to bring out the best in your tan. The products ensure a longer lasting tan, to make it shimmer and provide a natural looking glow. We recommend using a Tan Extender as the perfect tan enhancement product for your clients. The Tan Extender is enhanced with DHA and enriched with Vitamin E, Aloe Vera & Green Tea extract to nourish the skin. Applied daily, this product will gradually build up a natural looking tan and/or extend an existing tan. This Bronzing Cream is designed to give an all over bronzed look by applying generously all over the body (can be used on the face as desired.) Enriched with shea butter, macadamia oil and sweet almond oil; this product is designed to deeply nourish and moisturise your skin, whilst giving an instant natural looking bronzed tan. Great for enhancing an existing tan. This shimmering bronzer is designed to give an all over healthy bronzed glow to the skin. This product helps enhance an existing tan. 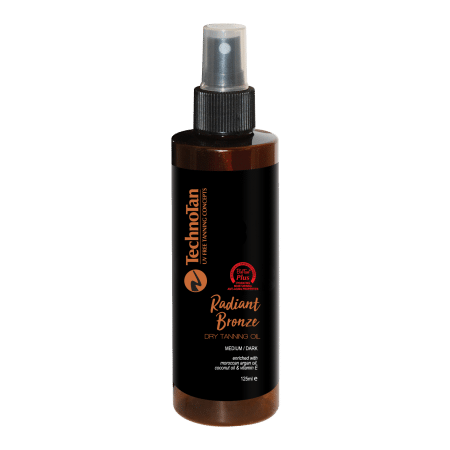 Radiant Bronze Dry Tanning Oil is a Holy Grail product for tanners! A quick to apply tanning oil that does not require wash off. Super convenient, nourishing and absorbent, a dose of it will leave your skin beautifully bronzed, hydrated and moisturised. The TechnoTan Tanning Mousse is designed to give your skin a natural glowing tan within 4-6 hours. This light weight formula has unique moisturising and skin rejuvenating properties which spreads smoothly onto the skin to give an even streak free tan. Available in Caramel, Choc Fudge and Mocha. Recommended to use with a Tan Application Mitt. The TechnoTan Tan Application Mitt is designed to aid in the application of sunless tanning products, resulting in a flawless finish, whilst protecting your hands from unsightly stains.